While home we looked at some old pictures with my grandmother. 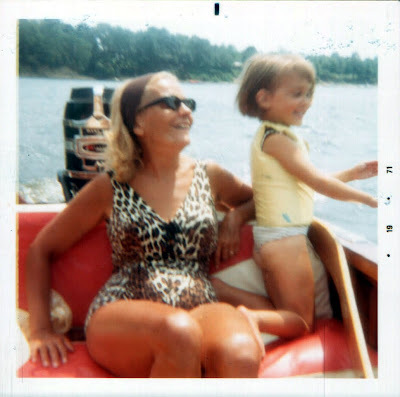 This one's not the clearest but it did capture good times with grandma. This is on her vintage ski boat Old Woody. I'm barely 4, and she's in her 50s but could still slalom water ski. She tanned dark every summer. (Still does.) Suntan lotion, the low roar of the motor as the boat dipped and strained to yank another skier out of the lake, a dripping wet ski laid on its side to dry, little passengers wrapped in big beach towels with their hair whipping in the wind. I never really picked up skiing, but I definitely inherited her love of water. Also a fondness for animal prints. What an adorable picture. I can definitely see where you get your style inspiration from! Thanks. I consider that a HUGE compliment. oh my gosh, how cute are you???!!! your grandma is a VERY stylish lady.